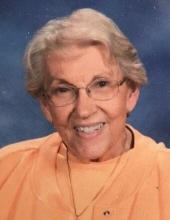 Norma Stanton, 84, of Morristown, NJ, passed away on April 7, 2019, at Morristown Medical Center after a short illness surrounded by her family and friends. She was born on September 10, 1934, in Hambleton, WV to Kermit and Helen Collett. Norma graduated from Alderson Broaddus College in Philippi, WV. Norma moved to Morristown in 1957. She worked at All Souls Hospital and Morristown Memorial Hospital. She worked as a Public Health nurse for the Town of Morristown for 31 years and during those 31 years she also worked as a school nurse for Assumption School. Norma was a member of the Church of Assumption. She was predeceased by her loving husband Johnny and her daughter Ann. Survivors include her brother Keith, (Carol) of Az, her four children, John David of Morristown, Barbara (Jack) of Fl, James (Kelly) of Budd Lake, and Theresa of Vineland; her seven grandchildren, Shawn, Sierra, Michael, Cole, Joshua, Noah and Jade, three great-grandchildren and several nieces and nephews. and the O.B.G. friends. A mass of Christian Burial will be celebrated at the Church of Assumption, Morristown on Saturday at 10 a.m. Interment at Holy Rood, Morris Township. Hours of visitation at the Doyle Funeral Home, 106 Maple Ave., Morristown on Friday from 3-7 p.m. In lieu of flowers, contributions may be made in Norma’s memory to the Weinstein Inpatient Hospice and Palliative Care Center ℅ of the Foundation for Morristown Medical Center, 475 South Street, 1st Floor, Morristown, NJ 07960. To send flowers or a remembrance gift to the family of Norma Stanton, please visit our Tribute Store. "Email Address" would like to share the life celebration of Norma Stanton. Click on the "link" to go to share a favorite memory or leave a condolence message for the family.